This widget talks directly to any iCalendar-compatible scheduling software (such as Google Calendar) and builds a great conference/meeting room door sign with the XDS-1060 or XDS-1062 or XDS-1078 signboards. How to use: download the file attachment below. Unzip to a USB stick formatted as FAT or FAT32. You should see a folder named "SMIL" in the root directory. Insert the USB stick into an IAdea media player and the content will load and play. In the SMIL folder you will also find a ".wgt" widget file which you can schedule independently via supporting Content Management Systems. This section provides information to help you build widgets using the IAdea Widgets Library for Digital Signage. The output of the widget should be similar to the following. Save the HTML widget code as file name "index.html"
Schedule the .wgt file in SMIL like any other media object (such as video), using the <ref> tag (see Scheduling a Widget using SMIL). You may consult http://A-SMIL.org for information regarding SMIL. Of course, showing a tiny "Hello, world." on a big screen is far from what digital signage needs. We will add more features to make this a more suitable tool. An advancement in HTML5 technology is the support for Web Fonts via CSS. 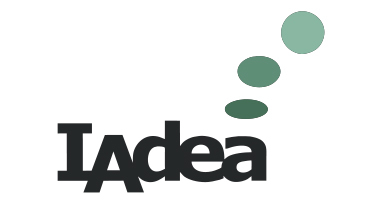 IAdea players currently support fonts built using the Open Type Font (OTF) and True Type Font (TTF) technologies. We will demonstrate using the beautiful Graublau Sans Web font provided by fonts.info. Note that each time the widget loads, your IAdea player may need to re-visit the provider of the font and check for updates. This runs the danger that if network connection becomes temporarily unavailable, your widget will not be able to render fonts correctly. so the font is loaded locally. When making the .wgt widget file, zip the font file into the .wgt package. Using Web Fonts is the recommended approach for keeping a consistent look for your HTML content. Making content interesting is a key to a successful digital signage project. We will now make the "Hello, world" widget really lively using the IAdea Widgets Library. The following revised "Hello, world" widget makes use of the Widgets Library. You will first need to download the GraublauWeb.otf font used in the previous sample code, and the iaWidgets.js file is in attachment below. A widget should have all its required HTML resources (such as fonts, style sheets, scripts) encapsulated in a zip-compressed file and given the file name extension ".wgt". While IAdea players can directly play HTML5 files, there are several benefits if HTML5 is scheduled as a media element in SMIL. Where a widget (.wgt) file is a zipped tree of an HTML document named "index.html" stored with all its external assets. The media element can be given a display duration, start and end condition, etc. just like any other media object referenced in SMIL. HTML5 can be directly linked from SMIL as a simple <text> media object. However, such usage can face a problem when device accidentally reboots while network is not available. When such an event occurs, the SMIL framework only caches the HTML document. Any external elements in the HTML presentation, such as images, scripts and iframes, would not be available from the cache system. To keep the entire HTML presentation persistent across power loss, it is advised that the entire HTML tree: the root HTML document and all its linked objects, are stored in what's known as the W3C Widget format. Simply explained, it is done by putting all needed files inside a directory structure with the root HTML saved as "index.html" and all URLs referneces relative. Then the directory tree is compressed in .zip format, and then renamed to .wgt (for widget). Note that the SMIL body must specify systemComponent="http://www.w3.org/1999/xhtml" to activate HTML5 support.